CARACAS (Reuters) - Venezuela's President Nicolas Maduro on Tuesday night railed against the U.S. Senate for passing a bill that would impose sanctions on government officials found to have violated protesters' rights during demonstrations earlier this year. "Who is the U.S. Senate to come sanction the nation of Bolivar," he thundered during a military act, in reference to South America's 19th century independence hero Simon Bolivar. "We don't accept insolent imperialist sanctions," he added to cheers from the audience, which included Argentine football icon and leftist Diego Maradona. The measure targets officials involved in what it considers a crackdown on political opponents during the three month-long street protests over crime and the economy that left 43 dead with victims on both sides. Maduro says the unrest was part of a broader U.S.-backed attempt to unseat him. The measure still needs to be passed by the U.S. House of Representatives and be signed by President Barack Obama to become law. While Washington had refrained from pushing for sanctions, an official said last month Obama would now back them. "If the crazy paths of sanctions is imposed, President Obama, I think you're going to come out looking very bad," Maduro added, before reciting verses by Chilean poet and leftist activist Pablo Neruda that Latin America can "come out of the rocks and the air to bite" if it feels threatened by North America. 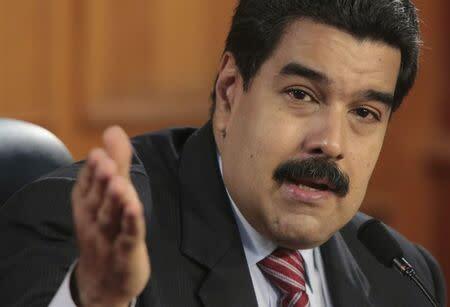 Maduro also again accused the U.S. embassy in Caracas of meddling in domestic affairs, saying he had "recordings" that it was seeking to corrupt government officials. "They've bought some people to say they're "Chavistas" or use their status as "Chavistas" to put a dagger in the people's back, to betray the people, to put on a red shirt to try to divide the revolutionary forces," he added in reference to the movement created by the late president Hugo Chavez and his emblematic red-shirted supporters. Though Maduro frequently bashes his ideological foe the United States, the South American OPEC country continues to ship significant amounts of oil to its northern neighbor. Critics of Maduro say he blasts the United States to distract Venezuelans from the cash-strapped country's ballooning economic crisis. Some opponents also warn sanctions could play into Maduro's accusations that the United States is out to topple his government.